Cadillac hosted a small shindig in downtown L.A. today. Journalists were invited, drinks were poured, lunch was served. We also got a first look at the Cadillac CTS Coupe. It's very, very pointy. And ten kinds of hot. Gallery below. LOS ANGELES – Cadillac today unveiled the 2011 CTS Coupe, the latest and most dramatic of the brand's series of new designs to reach production. Slated to arrive in Cadillac showrooms in the spring of 2010, the CTS Coupe is a new luxury sports coupe designed to become the centerpiece of the brand's revised lineup. "CTS Coupe is the new focal point of Cadillac, expressing both our design and technical capabilities," said Bryan Nesbitt, Cadillac general manager. "It is intended to appeal to a new generation of car enthusiasts." The Coupe joins the CTS Sport Sedan, the 556-horsepower (415 kW) CTS-V and new CTS Sport Wagon as the foundation of Cadillac's lineup. A high-performance V-Series edition of the Coupe will also be released in 2010. The CTS Coupe's design carries over virtually unchanged from the concept car that was introduced at the North American International Auto Show in Detroit in 2008. The Coupe is a classic 2+2 layout bolstered with advanced technology, such as a rear- view camera system and a performance-oriented suspension system coupled to rear- wheel or all-wheel drive. CTS Coupe emerged as a proposal inside Cadillac's design studio, where designers have developed and evolved the brand's Art and Science design philosophy. "Cadillac has always been an emotional brand – it's about delivering art regardless of body style," said Max Wolff, director of exterior design for Cadillac. "With the CTS Coupe, it was about taking something very strong – the CTS Sport Sedan – and extending its potential." The coupe has the same wheelbase as the CTS, but an overall height that is approximately two inches (51 mm) lower and an overall length that is two inches (51 mm) shorter. Sculpted roof-mounted antenna for OnStar and XM Satellite Radio. At first glance, the shape of CTS Coupe is refreshingly simple, yet amplified with intricately carved details. Distinctive and original Cadillac signature cues combine with hand-sculpted forms, artfully articulating the confidence of the chassis. For example, the rear fenders were purposefully developed by hand in Cadillac design studios to visually acknowledge the RWD powertrain. The gestured profile, coupled with Cadillac's vertical taillamps and pronounced rear centerline, aim to achieve the most visually confident coupe in the segment. The CTS Coupe extends Cadillac's emerging performance credentials. 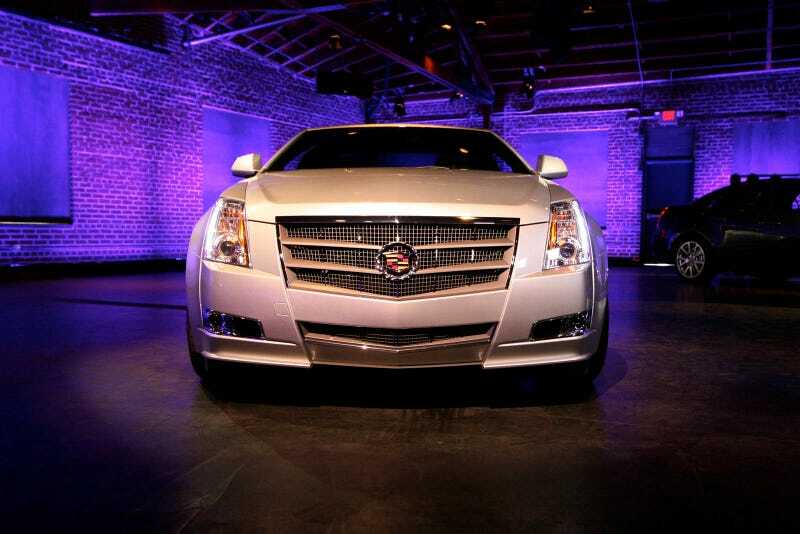 The CTS Coupe's standard powertrain consists of a direct injected 3.6L V-6 and six-speed manual transmission. Direct injection technology delivers fuel more precisely to increase the efficiency of combustion, enabling more power while maintaining fuel economy and lowering emissions – including a 25-percent drop in cold-start hydrocarbon emissions. The powertrain's performance is channeled through a chassis that delivers sports car performance without punishment. The hardware includes an independent short/long arm (SLA) front suspension system, with hydraulic control arm front bushings; and a multi-link rear suspension mounted on a fully isolated subframe. Also included are four-wheel disc performance brakes, premium steering and limited-slip differential. CTS Coupe blends handcrafted luxury with a contemporary, driver-focused interior that supports the car's high-performance capabilities. The interior includes hand-sewn accents covering the door, center storage console and instrument panel trim. 14-Way adjustable Recaro sport seats, previously exclusively offered on Cadillac's V-Series model, will be offered on all CTS Coupe models as an option. As with other Cadillac models, the CTS Coupe comes standard with OnStar with Turn- by-Turn Navigation, the first factory-installed, fully integrated GPS navigation system from OnStar. Cadillac has been a leading luxury auto brand since 1902. In recent years, Cadillac has engineered a historic renaissance led by dramatic new designs and global expansion. More information on Cadillac can be found at media.cadillac.com.